NetCredit offers online personal loans. Check your eligibility for up to $10,000 without affecting your credit score. Even build your credit history as you repay. 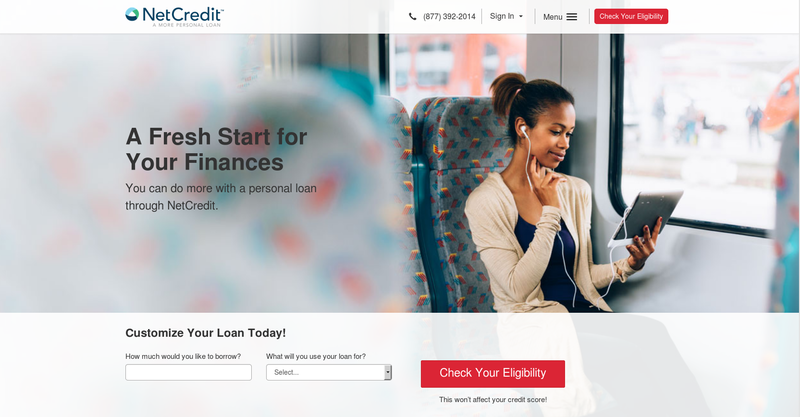 NetCredit is an online financial services provider located in the heart of downtown Chicago. It’s a subsidiary of Enova International, Inc., a NYSE listed company (ENVA), which gives us the expertise and resources to realize our vision and enhance our product offerings. In certain states, NetCredit has partnered with Republic Bank & Trust Company, Member FDIC, to offer personal loans with annual percentage rates of less than 36%. If eligible, your loan will be underwritten, approved, and originated by Republic Bank. However, NetCredit will still service your loan, meaning you can continue to rely on our Customer Support team to answer any questions or assist you throughout the lifecycle of your loan. You will also have access to your loan through your online account with NetCredit. All other installment loans will be made by a member of the NetCredit family of companies. Personal loans through NetCredit range from $1,000 to $10,000, but your eligibility will depend on your state of residence and your creditworthiness. Personal Loans: Personal loans come in various types including long-term and private loans. They also come with various interest rates and repayment periods. Installment Loans: If you find yourself in a situation where you need additional funds, an installment loan is one option you may want to consider. In contrast to short-term loans, installment loans generally offer larger amounts and are paid back over a longer period of time. Auto Repair Loans: Car repair loans can be personal loans, so called because the loan is made to the individual. Vehicle repair loans may be either secured or unsecured personal loans, depending on the lender. If it is unsecured, the loan typically requires a credit check. Read the Netcredit Personal Loans terms and conditions. Is Netcredit Available In Your State? Netcredit is available in the following states: Alabama, Arizona, Arkansas, California, DC, Delaware, Florida, Georgia, Idaho, Indiana, Kansas, Kentucky, Louisiana, Michigan, Mississippi, Missouri, Montana, Nebraska, New Mexico, North Dakota, Ohio, Oregon, South Carolina, South Dakota, Texas, Utah, Virginia, Washington, Wisconsin. NC Financial Solutions, LLC has received 3.9 out of 5 stars based on 6 Customer Reviews and a BBB Rating of A+. Business Management: Dave Fisher, CEO; Stephanie Klein, Director, NetCredit; Monica SanMiguel, Strategy & Operations Associate, NetCredit; Business Team Season Wolfe, Compliance.